Who doesn’t need more space in their house? Even those with massive amounts of space find some way to fill it and search for more. And those in smaller homes really feel the pinch of making do with fewer square feet. While most people search the Ikea catalog to find some way to organize their home, fit all of their clothes in their closets, and the like, house designers can squash the problem in the home design phase. 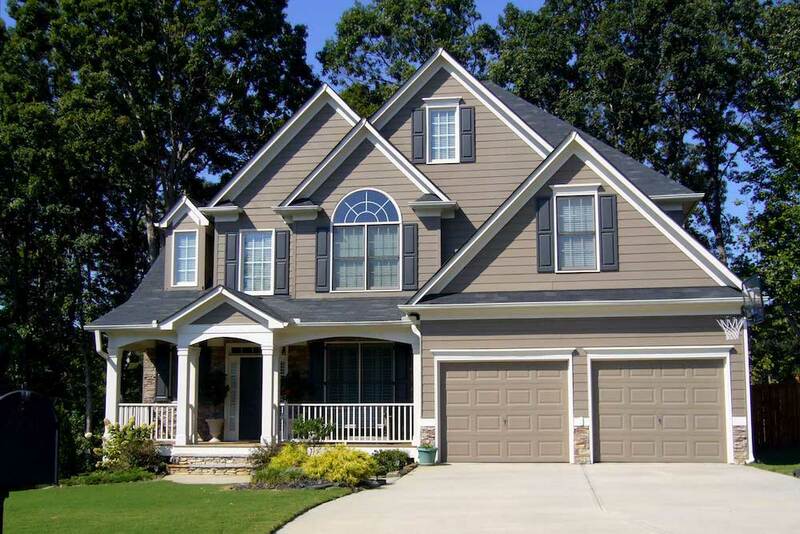 With a few design tricks and clicks of the home-design-software mouse, designers can create space efficient home plans that make smart use of every square foot to enable homeowners live larger in a smaller house, make day-to-day living easier, and their storage dreams come true. 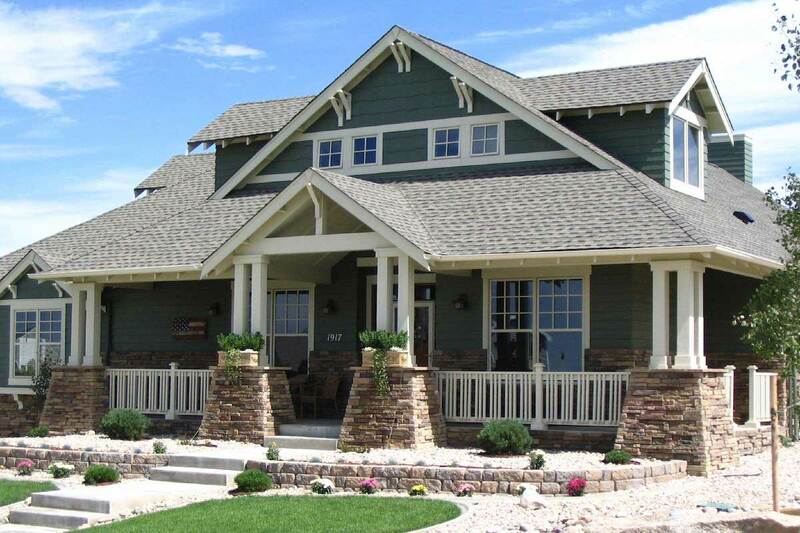 This average size 3-bedroom, 2.5-bath Country style home (under 2600 sq. 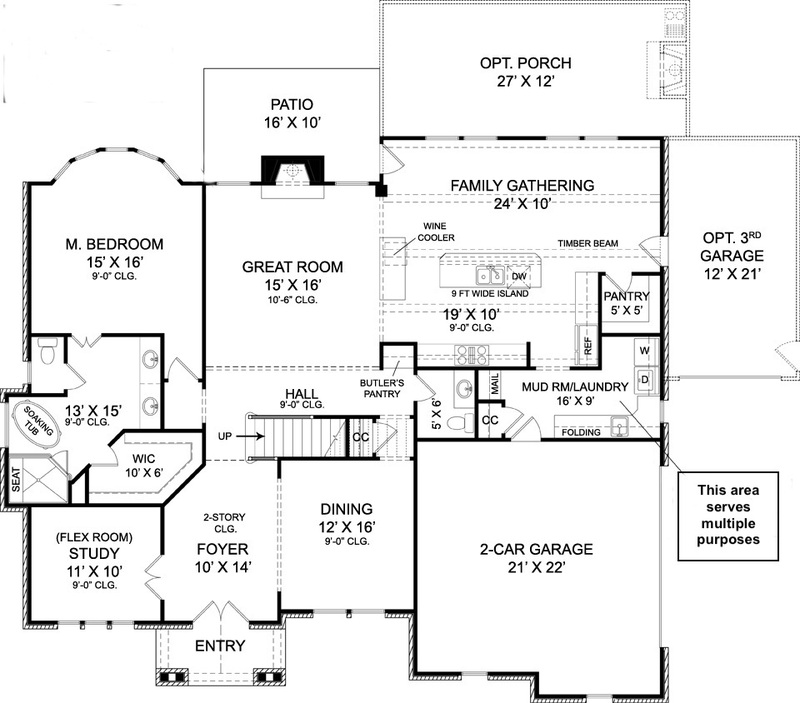 ft.) shows off many of the tricks designers use to make house plans more efficient. 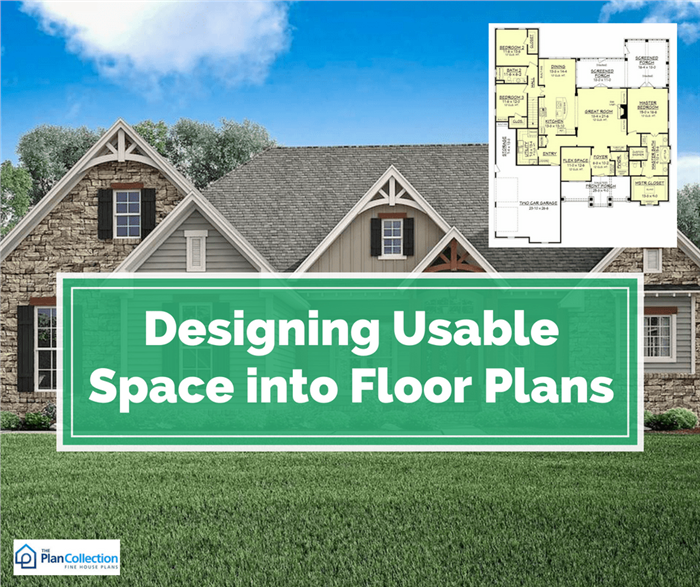 They include minimizing hallways, using open floor place, making rooms flexible, making the most of ourdoor space, gouping mudrooms and laundry rooms, and more (Plan #142-1168). 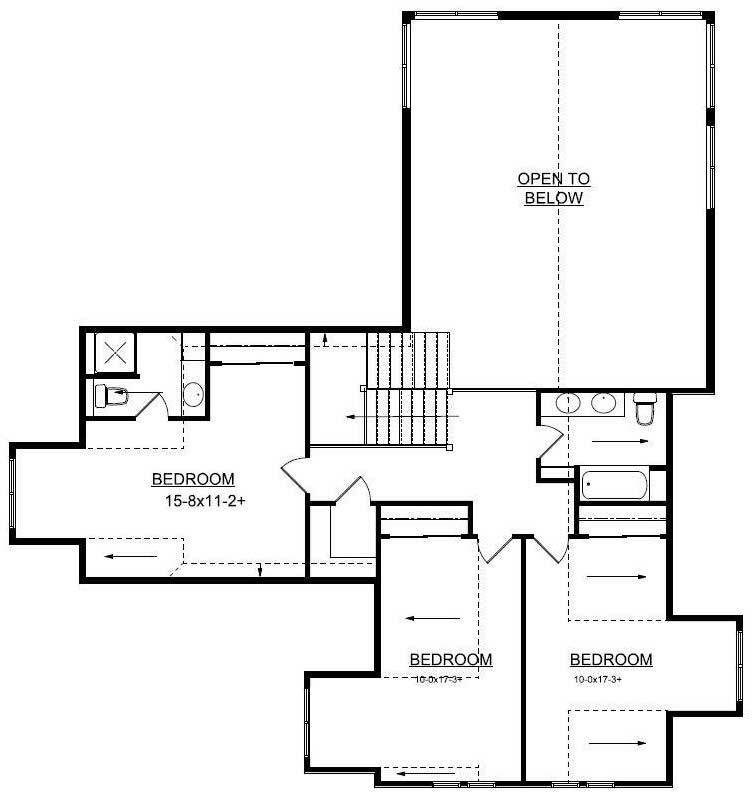 Who decided that having a long rectangular room that served no purpose other than to get from one room to the next was a thing in home design? It’s time to change it up. Some designers minimize – or even eliminate – hallways by having one room run right into another or by having multiple rooms, like bedrooms, branch off from a central spot. Reducing hallway space creates more room for bathrooms or bedrooms, which often get short-changed in a floor plan, especially one tight on square footage. Sure, it may only be a few inches here and there, but those are inches that can be devoted to a larger vanity – or more closet space. Another tactic designers use is to widen hallways that are necessary, allowing room for a nice bench to store your shoes and bags, a bookcase, or even handicap access. (Wheelchair accessibility – Universal Design – calls for wider hallways). This classic looking Arts and Crafts style home (top) has virtually no hallways in its main-level floor plan (center): all rooms are directly connected to others in a logical progression. 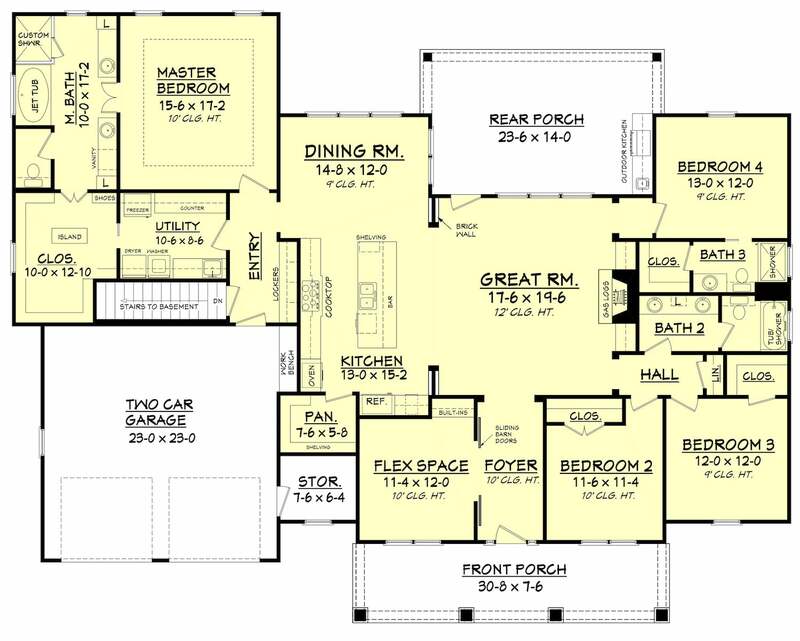 Even the upper level (bottom) of the 4-bedroom, 3.5-bath home plan minimizes hallways with a short run between the left-side guest suite bedroom and the front left bedroom (Plan #161-1001). 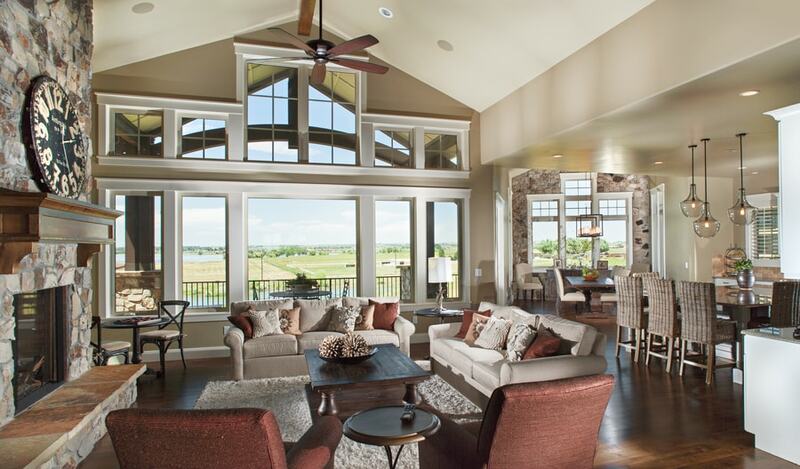 Open floor plans help the flow of the home and allow for more interaction. If there really is no need for a wall, why put one up? Designers know you can make the most of your home design by borrowing space from one or more rooms and combining them. For example, designers often remove the walls that normally divide living space, dining space, and the kitchen – usually called open floor plan. You can define the separate spaces using furniture, which reduces the need to travel from one room to the next to check on the kids or converse with company. The floor-to-ceiling windows in the open floor plan Great Room of this 4-bedroom, 3.5-bath contemporary Craftsman style luxury home help bring the outdoors into the light-filled, spacious house (Plan #161-1067) . 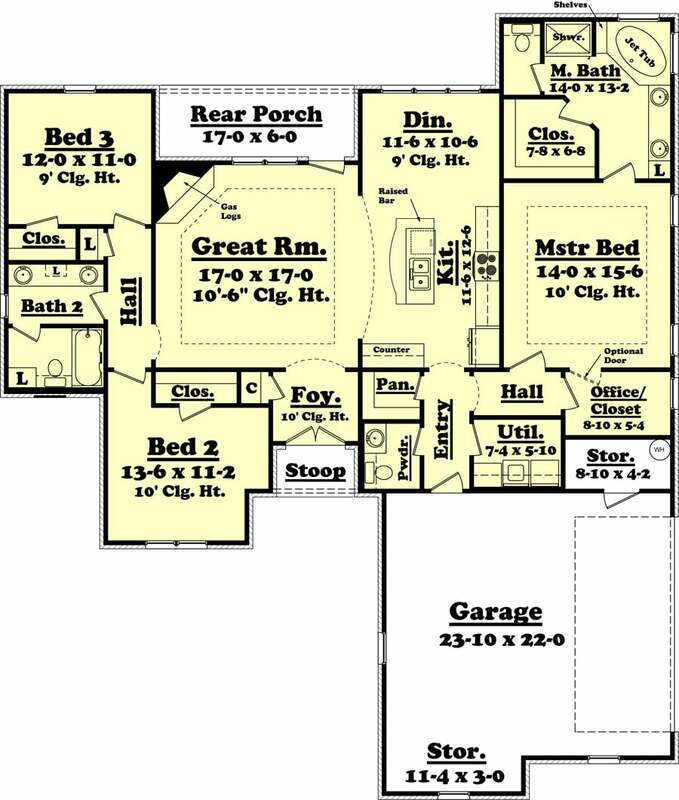 A great example of minimizing walls and sharing space between rooms this floor plan of a 3-bedroom, 2-bath Country Farmhouse style Ranch home (Plan #141-1243). The living, dining, and kitchen areas share one large space, and the only walls separate private bedroom areas. If there needs to be a divider, for a home office or bedroom, for example, consider a sliding pocket door, french doors, or even a barn door. Pocket doors and barn doors allow spaces to change from concealed to available quickly, while french doors still give the space that open feel and provide the privacy and peace while you take that quick phone call – or nap! In situations where space is limited or designers simply want to free up more room for other things, thry often create multi-purpose rooms. Known as flex space, using one room for multiple purposes really frees up the rest of the house. One example of this is doubling up the kitchen and dining room. Rather than have the food prep area and food consumption area be kept separate, many home designers create space-efficient floor plans by eliminating the rarely-used formal dining room. 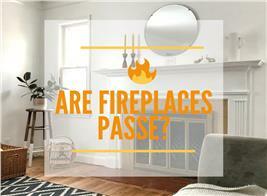 And homeowners love the difference! A couple of additional examples of multi-purpose rooms are offices also used as a spare bedrooms and bedrooms doubling as game rooms. 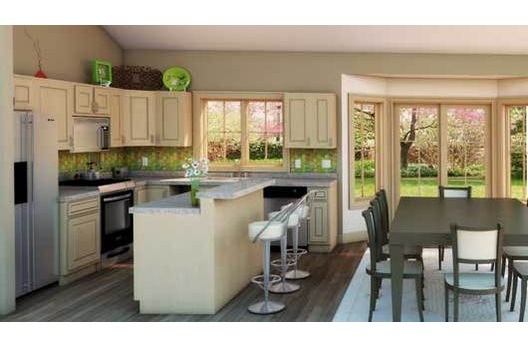 The kitchen and dining area occupy one space in this 3-bedroom, 2-bath Country Ranch home, doing away with the wasted space of a formal dining room (Plan #176-1012). 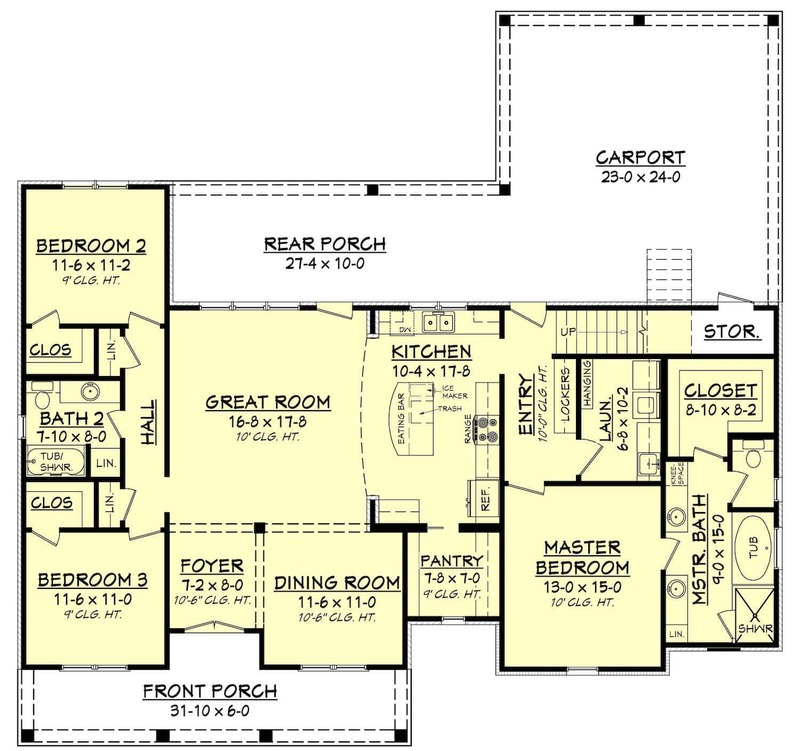 The designer of this floor plan uses flex space at the front of the house, which can be used for multiple purposes. 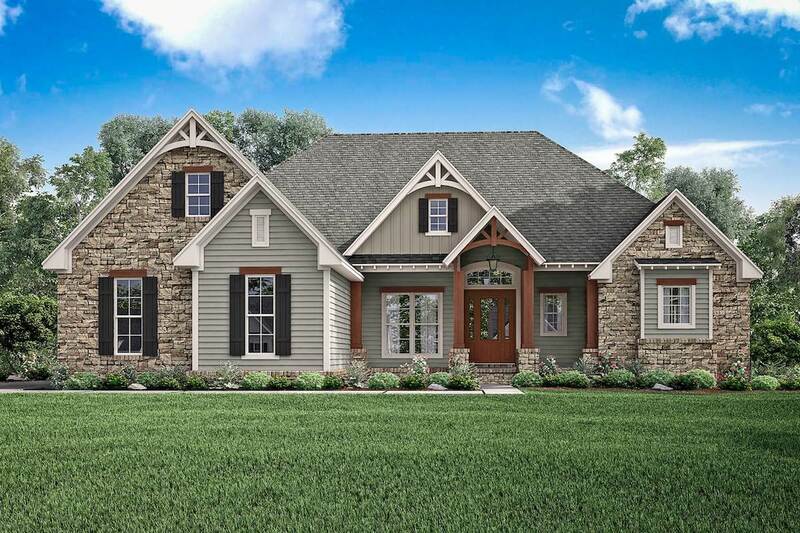 In this 4-bedroom, 3-bath Craftsman style home, the space could be used as a 5th bedroom, office, crafts room, exercise room, playroom, or any of these uses or more alternatively as the need arises, eliminating the need to dedicate space for mimited use (Plan #142-1102). Sinking into a nice luxurious bath at the end of the day is really the best way to leave all of your daily stresses behind. But how many bathtubs do you need? Think of all the space you can save by using a combination shower/bath, or better yet, a stall shower? Designers have thought of that. Laundry is never fun, but especially not in a two-story house. With most of the bedrooms upstairs, you spend your days hauling baskets overflowing with clothes up and down the stairs. It sounds exhausting just talking about it! A great way to cut out that back and forth is to put the laundry room upstairs. Convenient, right? Relocating the laundry room to the second floor has more appeal than simply reducing the work – it also leaves more space downstairs, which means you now have more room to enjoy company, stick in a side table and/or chairs, or create an alcove office (more on that later). This 2-story, 4-bedroom, 2.5-bath traditional Country style home (top) has the laundry room on the upper level (bottom) in the vicinity of the bedrooms, where dirty clothes are generated. With the laundry room here, climbing up and down stairs is reduced to a minimum and space on the main level is available for other purposes (Plan #163-1001). Speaking of laundry rooms, if it’s on the main floor, why not double it up as mudroom? Think of it as the ideal combination: you finally get out of the downpour and are excited to get in some warm clothes. You enter through the garage – or rear – entrance, slip out of your shoes and slosh out of your wet clothes. Rather than having to carry them dripping through the entire house to the dryer, you get up from the mudroom bench, cross the tile floor to the dryer, and drop them in. In no time at all, you are back in cozy warm clothes, reading a book by the fire. With a mudroom/laundry at the everyday entrance to the house (through the garage or at the rear or side of the house), designers have re-thought the foyer. Originally a kind of mudroom in a formal entrance area, the foyer has more and more been eliminated from the house plan altogether. A foyer is nice for a more formal feeling when you open the door to guests, but if you want them to feel instantly at home, it's really just taking up that precious space we’ve been talking about. With the mudroom tucked away neatly in or near the laundry room, it’s the perfect time to say goodbye to the formal entry. 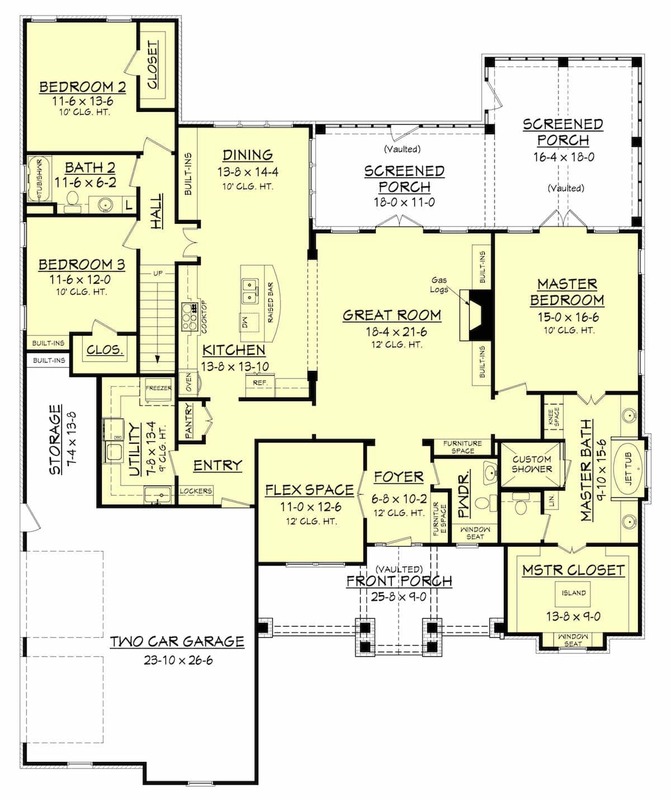 Top: This main-level floor plan of a 2-story, 4-bedroom, 3.5-bath Country style traditional home has a combined mudroom/laundry off the garage entrance to the house. The space also serves as the mail holding/sorting center for the household (Plan #106-1309). 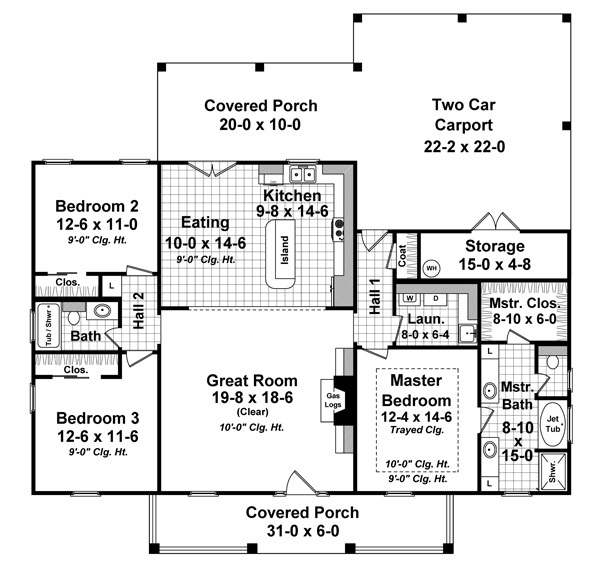 Bottom: The designer of the 1-story, 3-bedroom, 2-bath Acadian style home illustrated by this floor plan uses the area inside the rear entrance to the house as the combined mudroom/laundry space (separated by lockers and an optional door). 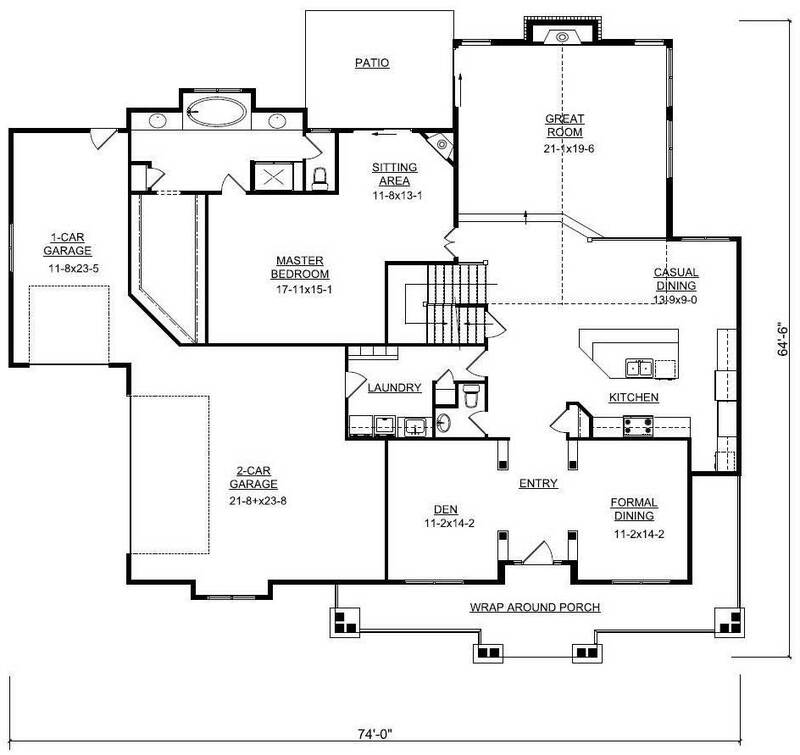 The area also serves as the entrance to the private master suite (Plan #142-1163). It may be time to reconsider having a dedicated office space if you don’t really need that whole room for checking your emails. Some designers use the space for something more suited to your needs and create an alcove or closet office instead. An alcove office is an office space in a desk-sized nook. The nook can be in the kitchen or living room or or often a master bedroom. The best thing about an office alcove is that it’s tucked away just enough to be functional and private while being able to maximize the rest of the space. The home office in this floor plan of a 3-bedroom, 2.5-bath, 1-story Southern Country style house is actually an alcove in the master suite and – at the option of the owner – can be a dedicated office or a second walk-in closet (Plan #142-1043). Designers know they open up space in a home by adding large windows. With nothing but a pane of glass between you and that view, the room will feel more than ten times bigger. But that’s not all! With the windows framing the ever-changing scenery, you won’t have to buy any paintings. Whether your view is of sky-scraping evergreens, colorful mountains, a shiny lake, or the twinkling lights of the city, this is one spot of the house that will be well-loved – without the addition of square feet. Two examples of framing nature in your home show how it makes the space seem larger. 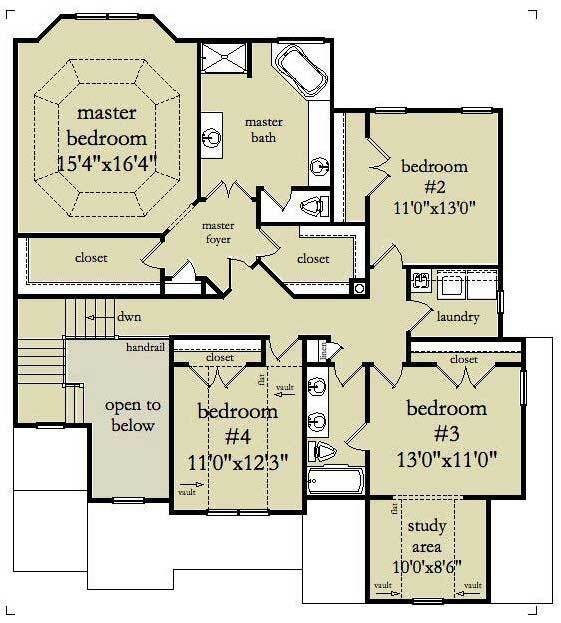 Top: This smaller 2-bedroom, 2-bath Modern style home has an open floor plan with two window walls (Plan #149-1837). Bottom: With more room to spare, this luxury Mediterranean has a grand staircase encased by a semicircular wall of windows looking out on the beauty of nature (Plan #161-1034). You don’t have to enjoy nature in your home only behind closed doors; designers make it part of your home by adding spacious doors that fold or slide past each other – or walls that “disappear.” With features like these, you’ll have trouble figuring out where your house ends and nature begins. 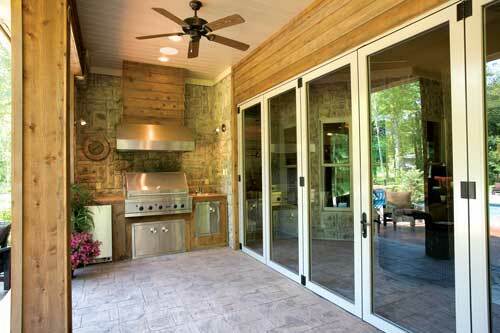 Step from your kitchen onto your patio that leads into your garden – truly making the most open of floor plans. 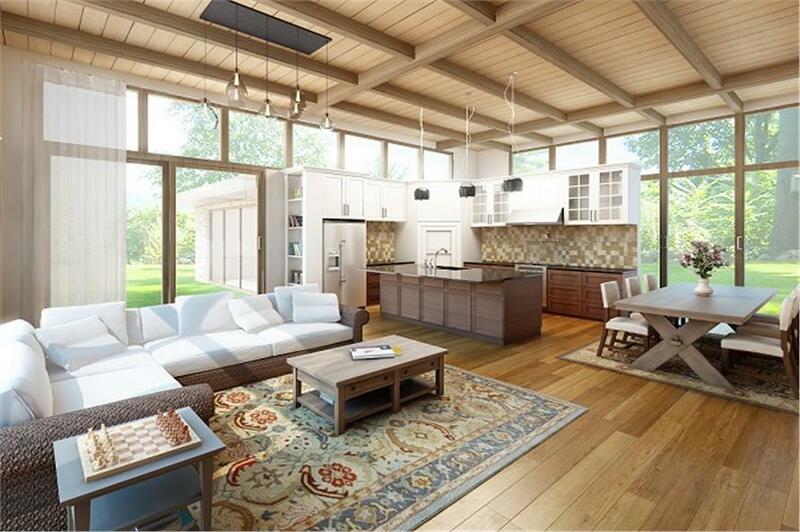 Large hinged, pivoting glass doors can open and "disappear" to blur the line between indoors and outdoors, virtually adding square footage to the home with this patio and outdoor kitchen in a 3-bedroom, 3.5-bath luxury Traditional style home (Plan 153-1897). 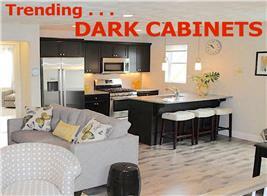 Have seen these design tricks in your house plan search as you try to find your dream home? 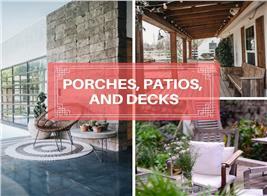 Which one or ones do you want to incorporate into your home? Footnote: the lead images of this article are from Plan # 142-1168.